What Is Dyscalculia? Dyscalculia is usually defined as a difficulty with calculations or arithmetic skills that is not explained by low intelligence or inadequate schooling. What Ages? Dyscalculia is lifelong, although many helpful strategies can improve math achievement. When adults with dyscalculia have calculator accommodations, they can perform at high levels in even mathematics-intense disciplines. How Do You Assess Dyscalculia? Typically dyscalculia is assessed by calculating the difference between a measure of IQ and math performance on an IQ and standardized math achievement test. The most common help math subtest on the WIAT-III and Woodcock Johnson is math facts fluency. Why is Knowing a Student is Dyscalculic Important for Standardized Tests and Higher Education? Although dyscalculia receives less attention than ADD or Dyslexia, as many as 1 in 10 students is dyscalculic so that failure to recognize the need can result in undeserved failure, grade retention, and classroom placement. 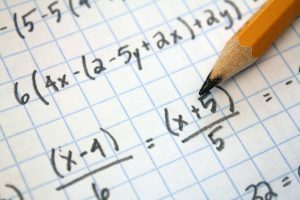 Older students with dyscalculia may be inappropriately discouraged from entering certain professions or pursuing higher education. What is the Science of Dyscalculia? 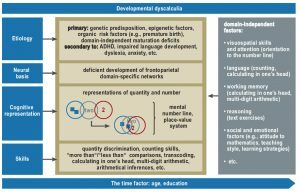 The science of dyscalculia is still in its early stages, but it appears there are multiple contributions to dyscalculia as well as individual variations among particular children. 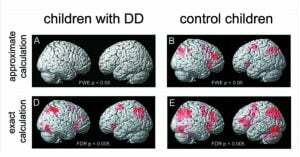 In the study at left, researchers found greater fMRI differences among students with dyscalculia when they were performing approximate rather than exact calculations. Other aspects of dyscalculia noted in other studies have included decreased working memory, visual-spatial processing difficulties (mental number line), language challenges, and other factors. Why Should Students with Dyscalculia Be Tested if they plan to take the New SAT? Starting in March 2016, the SAT will now have section where calculators are not permitted. The rationale behind that section is to test mental math and pencil and paper calculations for math problem solving. Here is a sample new SAT question where calculator use is not allowed: If and what is in terms of x? Click HERE to learn more about what tests are required to document dyscalculia or a math learning disability.